Here's some tips for marketing your Scottish restaurant business on a shoestring budget. Nothing groundbreaking - we're talking about primarily making use of a digital campaign and presenting the key strengths of your restaurant through brand collateral, a strong website, and investment in photography. However, we've included loads of useful specifics, based on our experiences of the last eighteen months. We've been working with Papamacs Gourmet Kitchen, a restaurant in Johnstone, Renfrewshire (near Glasgow), on an ongoing marketing campaign that commenced with a rebrand in September 2015. With Papamacs, we knew that we'd be able to invest some money at the start of the process on new brand collateral, but that on an ongoing basis, we'd be playing with a modest ads budget. Therefore, everything that we've done has been about laying a foundation that allows for efficient ad spend. Here, we've listed some of the lessons we've learned, with real-world examples. One of the biggest challenges for Papamacs was that their existing marketing presentation was all handled in-house, and had developed organically without an overarching strategy. So - everything from the brand to the decor to the in-house literature was all home-made, and as such, it didn't have the consistency of quality that their food presentation had. Our first port of call was to invest in designed collateral that brought the visual presentation up to the standard of the food, and that conveyed the key strengths of Papamacs. That meant developing a new brand, and all of the knock-on effects of that including new colour schemes, signage, interior decor - and crucially a brand new website that focused on creating repeat business for the business, and communicating all of the key strengths and services. It meant some up-front hassle and investment, and a lot of early disruption. However - those investments are good for minimum five years. And it means that none of the ad spend in future months would be wasted sending people to a product that doesn't look as good as it can do. Our feeling is that if the brand and the presentation isn't as it should be, then we can spend what we like getting eyeballs on the product, but we won't convert at the level that we'd like. Kind of an extension of the first point, but worth calling out on its own, because for a restaurant there's just no substitute: professional food photography was absolutely essential. Especially true given that, for Papamacs, their big differentiator in the local scene is the food itself. Not the price, not the location - the quality of the food. Chef/proprietor Scott Keenan is an experienced fine dining chef, who learned his craft in some of the most celebrated kitchens in Scotland, so it's quality and service, and not price, that defines their market offering. That had to be conveyed in the imagery. We handed off a simple brief to longtime friend of Papamacs, John Johnston, who - over the course of a half-day shoot - created a library of stunning images that we're still using seven months later, for everything from social media posts to posters to table cards to ads. He covered around fifteen dishes in a variety of angles, and delivered hi-res and lo-res files, for print and online use respectively. And I can't emphasise enough that it was worth every penny. Those images remain the lifeblood of the marketing for the restaurant - every single thing that we've pushed out into the world has featured John's images, putting the food front and centre. In terms of value for money for business-to-consumer advertising, there's no substitute: Facebook remains the best advertising platform in human history. One crucial way we use Facebook to expand Papamacs' online community is by targeting local people who don't already Like Papamacs with boosted posts and ads. That's nothing new in itself - it's incredibly obvious, actually - but there are a few novel ways that this process can be tweaked to make it more effective, as well as less time-consuming. Here's a super-basic little tip for an audience profile that we use every few months. We've set up a simple audience on Facebook, which basically includes everyone in Johnstone who doesn't already Like Papamacs - and we've saved it as a custom audience. By setting it up in the ads manager as a custom audience, we can then easily access it through the quick boosted posts option, and can even do so through the Pages Manager app on Android or iOS. We tailor particular posts to the existing Papamacs community, and we tailor others to this new audience; when posting to the new audience, we include the name of the geographical area (Johnstone) in order to alert folks to the fact that they're receiving locally relevant advertising. So we're promoting content to people in the local area who don't Like the page already, and whenever people Like the promoted post but not the page (which is common), we're then immediately sending an invite out for them to Like the page, a tactic that has had an extremely strong and consistent rate of success. That means that the outlay that was spent on a particular post - sending one piece of messaging out the local community - is extremely efficient, in that it reaches a new audience which we then immediately add to the community via a follow-up invite. Facebook is an absolutely central medium for our customer acquisition on Papamacs - we employ many tactics, and use many audience profiles, and that's just one of them - and just as important to our success are the things that we won't use Facebook for. There are no Like and Share competitions on the Papamacs page, for example - they cheapen the brand, they expand the audience in ways that aren't necessarily constructive (such as outside of the target geographical area), and they don't offer anything of value to the audience, so the reach is close to meaningless. This is one of many audience profiles that we use in Facebook for Papamacs and it's by far the most simplistic - take a look at our blog post on Boosting Posts for some more really quick tips on making life easy and reaching an audience at the same time on Facebook. So much of our efforts are spent trying to expand the audience and reach new people with our messaging - and of course it's crucial to the long term health of the business, but it's also expensive. There's great opportunity to communicate with your existing audience in-house using printed and wall-mounted collateral in a way that drives them to think of your restaurant in other contexts, or just to return more frequently. With Papamacs, the challenge has been creating a night-time buzz to match their healthy lunchtime trade. We immediately realised that they have a restaurant full of people every lunchtime Monday to Friday - and that those people were primed for messaging about returning for dinner, or about special events, etc. They were already in the restaurant, so it's extremely cost-effective to market to them. We created a template system for Papamacs to quickly and easily edit and print off calendar events to promote in-house, alongside frames to match the ones on the walls. We also left a blank section of their bespoke designed chalkboards, for them to feature regular updates to their events nights and in-house promotions. We also handed out data-capture cards, to use that existing customer base to feed back thoughts and observations about the service, to allow us to tweak it going forward. It also allowed us to acquire email addresses for email marketing. 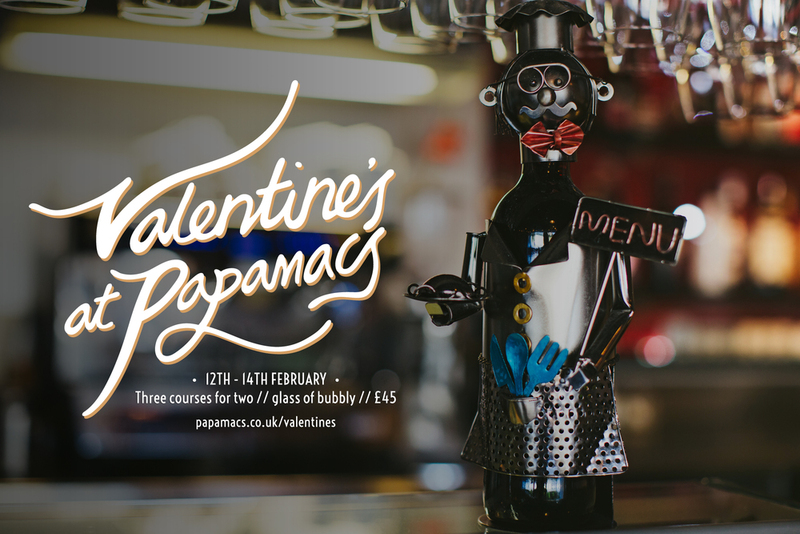 We're currently using a free MailChimp account to push out promotional emails for Papamacs - and it's an extremely cheap and simple way of delivering some of our most important messaging to customers. We've averaged a 46.5% open rate (versus an industry average of 20.2%), and a 5.8% clickthrough rate (versus an industry average of 1.5%). We've achieved those open and click rates with a combination of the following - a respectfully low frequency of emails (typically one monthly update); value propositions in the subject lines, every time - e.g. "Burger and a Sundae for a tenner (seriously) - this Thursday!" - and short, snappy emails packed full of calls to action and full of clickable links. We're also steadily acquiring new email subscribers by sending every customer who uses the online booking form an email asking if they want to join the mailing list, with incentives. It's all automated through MailChimp, and it's a really easy way of adding people to your sales funnels. Customers acting as ambassadors for the business is a crucial way of expanding the reach of the business, and bolstering the credibility of your own marketing endeavours. We've used in-house calls to action in Papamacs to try and encourage customers to act as ambassadors for the business - and it works! We use table cards plugging the Instagram information (both for tagging and hashtagging posts), and it results in an uplift both in following on Instagram, and in organic posts from customers that link to Papamacs or in some other way advocate for Papamacs. It's been a cheap and very effective technique for encouraging customers to Instagram their dinner. It's hard to write off local press and newspapers, but if the budget is tight then it's a difficult to justify putting too much into printed ads. Printed mediums with large reach are still very expensive vs. the amount of local reach that can be achieved for similar investment in a quality social media advertising platform like Facebook - and the opportunity to immediately add the customer to your sales funnel via digital marketing platforms is a key advantage over print ads. There are advantages of doing large-scale print campaigns, for general brand awareness and positioning - it can have the effect of legitimising the brand and it can certainly reach an audience who are completely cut off from online platforms. But those advantages only apply in the event that the business can afford to regularly place those ads, over the course of many months. It's a long game. For a shoestring budget, you need to be able to pull the customer straight into the sales funnel. We spent good money on a local campaign coinciding with Papamacs' fifth birthday in two local newspapers. And the outlay was significant, compared to the usual Facebook budget (from which funds were diverted to make up the shortfall). The effectiveness of local press is by definition hard to measure, but we saw a slow birthday weekend and a quiet dinner trade following the coverage; previous weekends with heavy social media saturation had been busy. All very anecdotal and unscientific - which is another reason that printed ads and offline advertorial are less appealing, because acquiring good data is much more difficult and requires diligent customer feedback. None of the data capture cards filled in by customers from subsequent weeks identified our local press coverage as the reason for their visit. However - that's based on a single campaign, and in all likelihood we wouldn't see an uplift in traffic unless we regularly placed those ads and ran stories. These images were carefully made by our graphic designers, in accordance with the brand guidelines and with specific promo campaigns in mind. That's of course the best case scenario. The second best case scenario is: don't bother to make bespoke artwork at all. The underlying message here is: don't try and make this stuff yourself. Seriously. You're definitely better off not trying, than doing something that looks unprofessional and thus damages the brand perception. It sends the message that you don't care about the quality of the product, or at least the aesthetic presentation of it. And certainly in the F&B market, that's not a good look. So, close the YouTube Photoshop tutorials, and get a designer on the case! Every project and every market is different, and for Papamacs we're changing things all the time and constantly experimenting. Our role is to continuously adapt with the changing objectives of the business, and the changing needs of the market. Looking to take the next step with your own restaurant marketing? Get in touch.